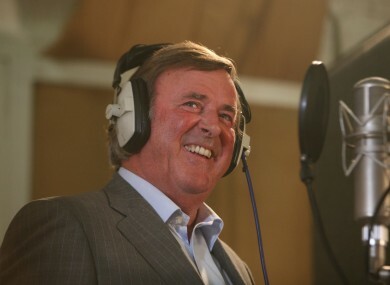 BROADCASTER TERRY WOGAN has died aged 77, the BBC has confirmed. Originally from Limerick, the presenter was one of the best-loved TV and radio personalities in the UK and Ireland – best known for helming Wake Up To Wogan on BBC Radio 2 and the TV chat show Wogan. He died after a short battle with cancer, his family said. President Michael D Higgins has led the tributes, describing him as “one of the great figures of broadcasting”. British Prime Minister David Cameron said Britain had lost a “huge talent”. I grew up listening to him on the radio and watching him on tv. His charm and wit always made me smile. Born in Limerick in 1938, he attended Crescent College and later Belvedere in Dublin, where he played rugby and was said to have excelled in acting and Latin. He later joined the Rathmines and Rathgar Musical Society. After a brief stint in banking, the young Wogan joined RTÉ as a presenter of documentaries and later quiz shows, where he earned a reputation as a consummate professional with a gift for ad-libbing. That light touch and ability to trade barbs with everyone from comedians to political leaders helped sustain a five decade long career at the BBC. He spent two lengthy periods in the chair of the BBC Radio 2 breakfast show – most recently between 1993 and 2009, quitting while the show was still at the height of its popularity. Known for his personal connection with listeners, who he referred to as TOGs (Terry’s Old Geezers and Gals) the show featured regular flights of fancy and exchanges of surreal witticisms with newsreaders and producers. His self-titled TV chat show, highlights of which are still broadcast by the BBC, ran between 1982 and 1992. The programme ran three nights a week from 1985 – and included now-infamous interviews with a high-kicking Nicolas Cage, a drunk George Best and a monosyllabic Anne Bancroft. He was also the voice of the Eurovision to millions of viewers – his acerbic observations proving a hit over more than 30 years in the commentary box (in 2001, for instance, he famously referred to the two Danish hosts as “doctor death and the tooth fairy”). Wogan also began presenting the long-running Children in Need telethon in 1980 (he pulled out of last year’s show for health reasons) which is estimated to have raised over £600 million for charity. He was given a knighthood in 2005. Because he held both British and Irish citizenship, and because Ireland was not a republic when he was born, he was entitled to be known as ‘Sir’. “Sir Terry Wogan died today after a short but brave battle with cancer,” a family statement this morning said. “He passed away surrounded by his family. While we understand he will be missed by many, the family ask that their privacy is respected at this time. BBC director general Tony Hall described him as a national treasure. “Today we’ve lost a wonderful friend,” he said. “He was a lovely, lovely man and our thoughts are with his wife and family. President Higgins said the broadcaster had made “a distinguished contribution to television and in particular to the medium of radio”. His rise to the top of radio listenership in the United Kingdom was a great tribute to his breadth of knowledge and in particular his unique, very personal sense of humour. Email “Broadcaster Terry Wogan has died, aged 77”. Feedback on “Broadcaster Terry Wogan has died, aged 77”.